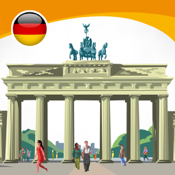 Jourist Publishing is pleased to present the unique language tool, Learn German Words, specially developed to help you remember words effectively using the flashcard drill method. The app includes more than 5,000 words. Each word is presented in written form and includes a recording of the word being pronounced by an native German speaker. Thirty topic dictionaries are available for you to use as you learn (Food and Cooking, Medical, Business, Animals, and so on). 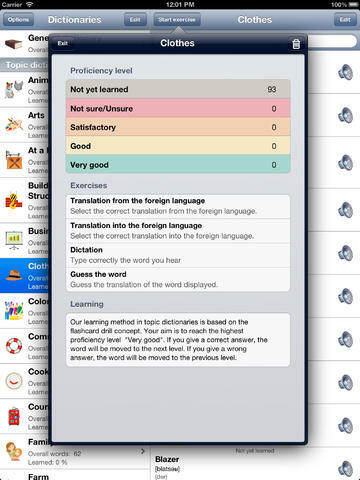 You can also create your own topic dictionaries, adding your own words or selecting them from the general dictionary. This convenient learning method (based on the Leitner flashcard system) enables you to memorize German words as quickly as possible. The program offers a choice of four different exercises: Translation into English, Translation into German, Dictation and Guess the Word. • Vocabulary of more than 5,000 German words. • 30 topic dictionaries: Cars and Transport, In The Restaurant, Military Terminology, Time, Geography, Grammar, Business, Food and Cooking, Animals, Farming, Art, Rocks and Minerals, Medical, Music, Countries, Science and Technology, Fruit and Vegetables, Clothes, Weather, Travel and Vacations, Plants, Family, Sport, Construction, Household, Colors, Commonly Used Words, Feelings and Emotions, School, Languages. • Constantly expanding selection of topic dictionaries. The app will be updated as new dictionaries are released. • Each word includes a recording of the word being pronounced by a native speaker and a written transcription of the German word. • Option to create and edit personal dictionaries. 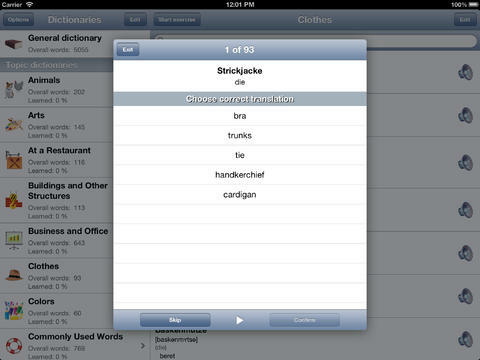 • Store and synchronize dictionaries in iCloud. Easy syncing of data between iPhone and iPad. • Choice of four different exercises: Translate into English, Translate into German, Dictation and Guess the Word.